Exploring OKC's hottest arts, food and music scenes. 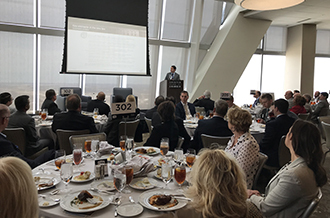 Each month, Chamber Forum brings thought leaders together to discuss major initiatives, programs and current issues that impact Oklahoma City's business climate, economy and community. See it. Eat it. Sing it. The August Chamber Forum will explore what's new and hot in the arts, food and music scenes across Oklahoma City. Entertainment and tourism continues to be one of Oklahoma City's fastest growing economies, and while there is much to celebrate around the visitor environment, life-long residents of OKC are finding new and exciting exhibits to see, music to hear and foods to eat daily across the city. At the August Chamber Forum, Oklahoma City's entertainment experts will highlight the cool factor around Oklahoma City's hottest arts, food and music scenes. Individual tickets are $35 for Chamber members and $55 for nonmembers. Online registration is currently closed. For more information or to purchase tickets, email register@okcchamber.com or call 405-297-8921.